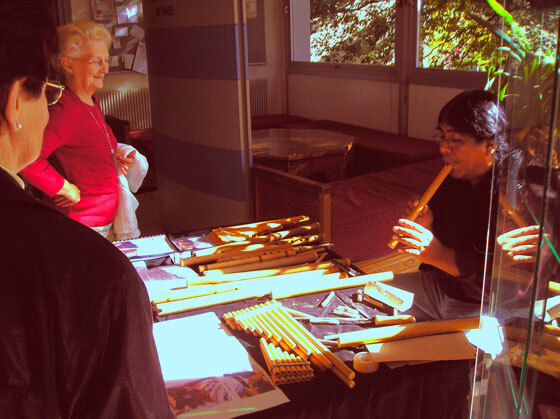 If you wish further more information dealing with the fabrication, the exhibition or the interpretation of andins flutes, we may give you some more complete documentation. 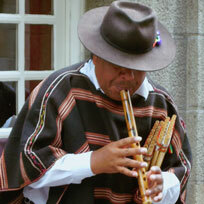 He's musician and expert with flutes from the Andes. In Bolivia, he was part of 2 Bands : PAJA BRAVA and RUMILLAJTA and both were playing music from the Andes. He went on Tour with them throughout Europe. In september 1988 he took part in the CD recording 'TINKUNA' with the group BOLIVIA MANTA from Paris. In May 1990 he also participated to the international Piccolo (flute de pan?) 's festival with the band KOLLA AYMARA from Paris. In July 1990 he left for Tokyo in order to animate an international conference about the developpment with the band MACHAQA QHANTATI.In 1991, he created with some other musicians the band LLAPAKU with whom he recorded 5 tapes and 6 CD. He had a share in the recording of PHILIPPE AVRIL in June 1996 and to BRUNO's recording (who interprets children's songs) in October 1998. Thanks to some Equatorians musicians' request he left for the USA in December 97,99,and 2000. He was invited by the RUPHAY to play in Swiss in November 2006 and to participate to their latest CD in 2008.